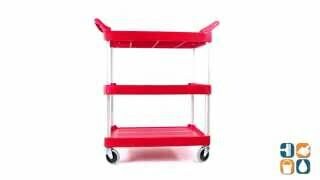 This 3-shelf utility cart from Rubbermaid is Versatile, ideal use with for audio/video, filing, food service and more. Shelves feature 1/4" lip on three sides and one flat side for easy loading. Brushed aluminum uprights, dual molded handles. This Rubbermaid service cart weight capacity is 200 lbs. Caster/Glide/Wheel: Four 4" Non-Marking Swivel Casters.